AgriFutures Chicken Meat Program Advisory Panel chair Guy Hebblewhite. THE AgriFutures Chicken Meat Program is off to a flying start for 2019, with a change in leadership and a host of new projects in the wings to boost the productivity and efficiency of chicken meat production and deliver safe food and good animal welfare outcomes. 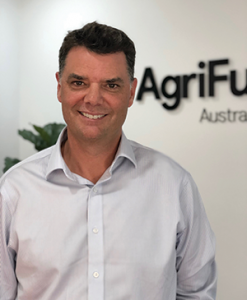 Key to determining new program investment for 2019 is the AgriFutures Chicken Meat Program Advisory Panel, which recently welcomed panel member and former Deputy Chair Guy Hebblewhite into the position of Advisory Panel Chair. As an experienced chicken meat producer and Nuffield Scholar, Guy was elevated to the position of Chair for his industry leadership, unique scientific and hands-on field expertise, and commitment to the growth of the industry. The AgriFutures Chicken Meat Program Advisory Panel is a key link between industry and the RD&E program, providing the structure to determine research priorities and make investment decisions. The Panel consists of a team of experts appointed for their knowledge and experience in RD&E and the chicken meat industry. “The Advisory Panel offers a unique insight into the chicken meat industry,” Mr Hebblewhite said. “We have a diverse range of skills and expertise. “This diversity has been the driving force behind RD&E investment and has played a pivotal role in securing new research projects for 2019.” A series of open calls, or requests for research proposals have run over the past six months to gather ideas to support the program’s Five-Year RD&E Plan 2014-2019 and its objectives. “The AgriFutures Chicken Meat Program has made a significant investment in projects that protect the industry’s value such as food safety, the impact on the environment and projects that enhance the industry’s performance, such as nutrition, welfare and biosecurity. “For example, a project to develop national environment planning guidelines will ensure the industry reduces compliance burdens, such as lower costs, faster development approval processes and reduced incidences of legal action, and provide better planning and environmental outcomes for the industry and community,” Ms Townsend said. Another recent program investment has been the creation of the Chicken Meat RD&E extensionAUS website. The website supports the program extension efforts, offering a repository for resources linked to research projects including final reports, summaries, podcasts, event information and other news. In addition to research activity, the program has a firm focus on and commitment to capacity building. The announcement of Joshua Angove as the 2019 Gary Sansom Scholar is testament to the Program’s dedication to growing the future chicken meat workforce. The scholarship will allow Joshua to investigate how the nutrition and environment of the hen influences how efficiently her progeny grow. The outcomes of Joshua’s project are likely to have a positive impact internationally because the breed of chicken reared in Australia is also reared around the world. Production gains identified in this project can be replicated elsewhere, which is an exciting prospect for the budding scientist. 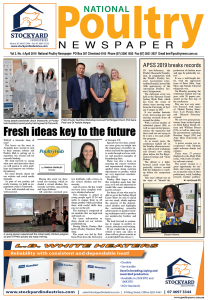 “It’s a credit to the vision of the AgriFutures Chicken Meat Program that they see the value in supporting young researchers to become leaders in the chicken industry and it provides motivation for young researchers to keep going and get through their PhD,” Mr Angove said. PreviousPrevious post:April 2019NextNext post:Are worms a problem?